Borosilicate glass is a type of glass with silica and boron trioxide as the main glass-forming constituents. Borosilicate glasses are known for having very low coefficients of thermal expansion (~3 × 10−6 K−1 at 20 °C), making them resistant to thermal shock, more so than any other common glass. Such glass is less subject to thermal stress and is commonly used for the construction of reagent bottles. Borosilicate glass is sold under such trade names as Simax, Borcam, Borosil, Suprax, Kimax, Heatex, Endural, Schott, or Refmex, Kimble, and some (but not all) items sold under the trade name Pyrex (see PYREX details in History section below). Borosilicate glass was first developed by German glassmaker Otto Schott in the late 19th century. Otto Schott is also founder of today's SCHOTT AG, which sells borosilicate glass under the brand name DURAN since 1893. Another manufacturer of DURAN is the DURAN Group. After Corning Glass Works introduced Pyrex in 1915, the name became a synonym for borosilicate glass in the English-speaking world. However, borosilicate glass is the name of a glass family with various members tailoring completely different purposes. Most common today is borosilicate 3.3 glass like SCHOTT Duran and Pyrex by Corning. The European manufacturer of Pyrex, Arc International, uses borosilicate glass in its Pyrex glass kitchen products; however, the U.S. manufacturer of Pyrex kitchenware uses tempered soda-lime glass. Thus Pyrex can refer to either soda-lime glass or borosilicate glass when discussing kitchen glassware, while Pyrex, Bomex, Duran, TGI and Simax all refer to borosilicate glass when discussing laboratory glassware. The real difference is the trademark and the company that owns the Pyrex name. The original Corning ware made of borosilicate glass was trademarked in capital letters (PYREX). When the kitchenware division was sold, the trademark was changed to lowercase (pyrex) and switched to low thermal-expansion soda-lime glass. The bottom of new kitchenware and old kitchenware can be inspected for an immediate difference. The scientific division of Pyrex has always been using borosilicate glass. In addition to quartz, sodium carbonate and aluminium oxide traditionally used in glassmaking, boron is used in the manufacture of borosilicate glass. The composition of low-expansion borosilicate glass, such as those laboratory glasses mentioned above, is approximately 80% silica, 13% boric oxide, 4% sodium oxide and 2–3% aluminium oxide. Though more difficult to make than traditional glass due to the high melting temperature required (Corning conducted a major revamp of their operations to manufacture it), it is economical to produce. Its superior durability, chemical and heat resistance finds excellent use in chemical laboratory equipment, cookware, lighting and, in certain cases, windows. Borosilicate glass is created by adding boric oxide to the traditional glassmaker's frit of silica sand, soda, and ground lime. Since borosilicate glass melts at a higher temperature than ordinary silicate glass, some new techniques were required for industrial production. Borrowing from the welding trade, burners combining oxygen with natural gas were required. The manufacturing process depends on the product geometry and can be differentiated between different methods like floating, tube drawing or moulding. The common type of borosilicate glass used for laboratory glassware has a very low thermal expansion coefficient (3.3 × 10−6 K−1), about one-third that of ordinary soda-lime glass. This reduces material stresses caused by temperature gradients, which makes borosilicate a more suitable type of glass for certain applications (see below). Fused quartzware is even better in this respect (having a fifteen times lower thermal expansion than soda-lime glass), however the difficulty of working with fused quartz makes quartzware much more expensive; borosilicate glass is a low-cost compromise. While more resistant to thermal shock than other types of glass, borosilicate glass can still crack or shatter when subjected to rapid or uneven temperature variations. When broken, borosilicate glass tends to crack into large pieces rather than shattering (it will snap rather than splinter). 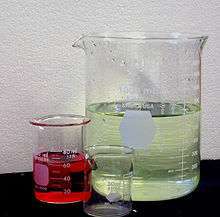 The softening point (temperature at which viscosity is approximately 107.6 poise) of type 7740 Pyrex is 820 °C (1,510 °F). Borosilicate glass is less dense (about 2.23 g/cm3) than typical soda-lime glass due to the low atomic mass of boron. The temperature differential that borosilicate glass can withstand before fracturing is about 165 °C (329 °F). This compares well with soda lime glass, which can withstand only a 37 °C (99 °F) change in temperature and is why typical kitchenware made from traditional soda-lime glass will shatter if a vessel containing boiling water is placed on ice, but Pyrex or other borosilicate glass laboratory will not. Optically, borosilicate glasses are crown glasses with low dispersion (Abbe numbers around 65) and relatively low refractive indices (1.51–1.54 across the visible range). For the purposes of classification, borosilicate glass can be roughly arranged in the following groups, according to their oxide composition (in mass fractions). Characteristic of borosilicate glasses is the presence of substantial amounts of silica (SiO2) and boric oxide (B2O3, >8%) as glass network formers. The amount of boric oxide affects the glass properties in a particular way. Apart from the highly resistant varieties (B2O3 up to a maximum of 13%), there are others that – due to the different way in which the boric oxide is incorporated into the structural network – have only low chemical resistance (B2O3 content over 15%). Hence we differentiate between the following subtypes. The B2O3 content for borosilicate glass is typically 12–13% and the SiO2 content over 80%. High chemical durability and low thermal expansion (3.3 × 10–6 K−1) – the lowest of all commercial glasses for large-scale technical applications – make this a multitalented glass material. High-grade borosilicate flat glasses are used in a wide variety of industries, mainly for technical applications that require either good thermal resistance, excellent chemical durability, or high light transmission in combination with a pristine surface quality. Other typical applications for different forms of borosilicate glass include glass tubing, glass piping, glass containers, etc. especially for the chemical industry. In addition to about 75% SiO2 and 8–12% B2O3, these glasses contain up to 5% alkaline earths and alumina (Al2O3). This is a subtype of slightly softer glasses (as compared with non-alkaline-earth borosilicate glass), which have thermal expansions in the range (4.0–5.0) × 10–6 K−1. Glasses containing 15–25% B2O3, 65–70% SiO2, and smaller amounts of alkalis and Al2O3 as additional components, have low softening points and low thermal expansion. Sealability to metals in the expansion range of tungsten and molybdenum and high electrical insulation are their most important features. The increased B2O3 content reduces the chemical resistance; in this respect, high-borate borosilicate glasses differ widely from non-alkaline-earth and alkaline-earth borosilicate glasses. Among this glasses are also borosilicate glasses that transmit UV-ray down to 180 nm, which combine the best of the borosilicate glass- and the quartz world. Virtually all modern laboratory glassware is made of borosilicate glass. It is widely used in this application due to its chemical and thermal resistance and good optical clarity, but the glass can react with sodium hydride upon heating to produce sodium borohydride, a common laboratory reducing agent. Fused quartz is also found in some laboratory equipment when its higher melting point and transmission of UV are required (e.g. for tube furnace liners and UV cuvettes), but the cost and difficulty of working with quartz make it excessive for the majority of laboratory equipment. Additionally, borosilicate tubing is used as the feedstock for the production of parenteral drug packaging, such as vials and pre-filled syringes, as well as ampoules and dental cartridges. The chemical resistance of borosilicate glass minimizes the migration of sodium ions from the glass matrix, thus making it well suited for injectable-drug applications. This type of glass is typically referred to as USP / EP JP Type I.
Borosilicate is widely used in implantable medical devices such as prosthetic eyes, artificial hip joints, bone cements, dental composite materials (white fillings) and even in breast implants. Many implantable devices benefit from the unique advantages of borosilicate glass encapsulation. Applications include veterinary tracking devices, neurostimulators for the treatment of epilepsy, implantable drug pumps, cochlear implants, and physiological sensors. During the mid-twentieth century, borosilicate glass tubing was used to pipe coolants (often distilled water) through high-power vacuum-tube–based electronic equipment, such as commercial broadcast transmitters. Borosilicate glasses also have an application in the semiconductor industry in the development of microelectromechanical systems (MEMS), as part of stacks of etched silicon wafers bonded to the etched borosilicate glass. Glass cookware is another common usage. Borosilicate glass is used for measuring cups, featuring screen printed markings providing graduated measurements. Borosilicate glass is sometimes used for high-quality beverage glassware. Borosilicate glass is thin and durable, microwave- and dishwasher-safe. Many high-quality flashlights use borosilicate glass for the lens. This increases light transmittance through the lens compared to plastics and lower-quality glass. Several types of high-intensity discharge (HID) lamps, such as mercury-vapor and metal-halide lamps, use borosilicate glass as the outer envelope material. New lampworking techniques led to artistic applications such as contemporary glass marbles. The modern studio glass movement has responded to color. Borosilicate is commonly used in the glassblowing form of lampworking and the artists create a range of products such as jewelry, kitchenware, sculpture, as well as for artistic glass smoking pipes. Lighting manufacturers use borosilicate glass in their refractors. Organic light-emitting diode (for display and lighting purposes) also uses borosilicate glass (BK7). The thicknesses of the BK7 glass substrates are usually less than 1 millimeter for the OLED fabrication. Due to its optical and mechanical characteristics in relation with cost, BK7 is a common substrate in OLEDs. However, depending on the application, soda-lime glass substrates of similar thicknesses are also used in OLED fabrication. Most astronomical reflecting telescope use glass mirror components made of borosilicate glass because of its low coefficient of thermal expansion. This makes very precise optical surfaces possible that change very little with temperature, and matched glass mirror components that "track" across temperature changes and retain the optical system's characteristics. The optical glass most often used for making instrument lenses is Schott BK-7 (or the equivalent from other makers), a very finely made borosilicate crown glass. It is also designated as 517642 glass after its 1.517 refractive index and 64.2 Abbe number. Other less costly borosilicate glasses, such as Schott B270 or the equivalent, are used to make "crown-glass" eyeglass lenses. Ordinary lower-cost borosilicate glass, like that used to make kitchenware and even reflecting telescope mirrors, cannot be used for high-quality lenses because of the striations and inclusions common to lower grades of this type of glass. The maximal working temperature is 268 °C (514 °F). While it transitions to a liquid starting at 288 °C (550 °F) (just before it turns red-hot), it is not workable until it reaches over 538 °C (1,000 °F). That means that in order to industrially produce this glass, oxygen/fuel torches must be used. Glassblowers borrowed technology and techniques from welders. Borosilicate glass has become the material of choice for fused deposition modeling (FDM), or fused filament fabrication (FFF), build plates. Its low coefficient of expansion makes borosilicate glass, when used in combination with resistance-heating plates and pads, an ideal material for the heated build platform onto which plastic materials are extruded one layer at a time. The initial layer of build must be placed onto a substantially flat, heated surface to minimize shrinkage of some build materials (ABS, polycarbonate, polyamide, etc.) due to cooling after deposition. The build plate will cycle from room temperature to between 100 °C and 130 °C for each prototype that is built. The temperature, along with various coatings (Kapton tape, painter tape, hair spray, ABS+acetone slurry, etc. ), ensure that the first layer may be adhered to and remain adhered to the plate, without warping, as the first and subsequent layers cool following extrusion. Subsequently, following the build, the heating elements and plate are allowed to cool. The resulting residual stress formed when the plastic contracts as it cools, while the glass remains relatively dimensionally unchanged due to the low coefficient of thermal expansion, provides a convenient aid in removing the otherwise mechanically bonded plastic from the build plate. In some cases the parts self-separate as the developed stresses overcome the adhesive bond of the build material to the coating material and underlying plate. Aquarium heaters are sometimes made of borosilicate glass. Due to its high heat resistance, it can tolerate the significant temperature difference between the water and the nichrome heating element. Specialty glass smoking pipes for cannabis and tobacco are made from borosilicate glass. The high heat resistance makes the pipes more durable. Most premanufactured glass guitar slides are also made of borosilicate glass. Borosilicate is also a material of choice for evacuated-tube solar thermal technology, because of its high strength and heat resistance. The thermal insulation tiles on the Space Shuttle were coated with a borosilicate glass. Borosilicate glasses are used for immobilisation and disposal of radioactive wastes. In most countries high-level radioactive waste has been incorporated into alkali borosilicate or phosphate vitreous waste forms for many years, and vitrification is an established technology. Vitrification is a particularly attractive immobilization route because of the high chemical durability of the vitrified glass product. This characteristic has been used by industry for centuries. The chemical resistance of glass can allow it to remain in a corrosive environment for many thousands and even millions of years. Borosilicate glass tubing is used in specialty TIG welding torch nozzles in place of standard alumina nozzles. This allows a clear view of the arc in situations where visibility is limited. Borofloat of Schott AG, a borosilicate glass, which is produced to flat glass in a float process. BK7 of Schott, a borosilicate glass with a high level of purity. Main use in lens and mirrors for laser, cameras and telescopes. Duran of DURAN Group, similar to Pyrex, Simax or Jenaer Glas. Fiolax of Schott, main use for containers for pharmaceutical applications. Ilmabor of TGI (2014 insolvency), main use for containers and equipment in laboratories and medicine. Jenaer Glas of Zwiesel Kristallglas, formerly Schott AG. Main use for kitchenware. It was initially thought that borosilicate glass could not be formed into nanoparticles, since an unstable boron oxide precursor prevented successful forming of these shapes. However, in 2008 a team of researchers from the Swiss Federal Institute of Technology at Lausanne were successful in forming borosilicate nanoparticles of 100 to 500 nanometers in diameter. The researchers formed a gel of tetraethylorthosilicate and trimethoxyboroxine. When this gel is exposed to water under proper conditions, a dynamic reaction ensues which results in the nanoparticles. Borosilicate (or "boro", as it is often called) is used extensively in the glassblowing process lampworking; the glassworker uses a burner torch to melt and form glass, using a variety of metal and graphite tools to shape it. Borosilicate is referred to as "hard glass" and has a higher melting point (approximately 3,000 °F / 1648 °C) than "soft glass", which is preferred for glassblowing by beadmakers. Raw glass used in lampworking comes in glass rods for solid work and glass tubes for hollow work tubes and vessels/containers. Lampworking is used to make complex and custom scientific apparatus; most major universities have a lampworking shop to manufacture and repair their glassware. For this kind of "scientific glassblowing", the specifications must be exact and the glassblower must be highly skilled and able to work with precision. Lampworking is also done as art, and common items made include goblets, paper weights, pipes, pendants, compositions and figurines. In 1968, English metallurgist John Burton brought his hobby of hand-mixing metallic oxides into borosilicate glass to Los Angeles. Burton began a glass workshop at Pepperdine College, with instructor Margaret Youd. A few of the students in the classes, including Suellen Fowler, discovered that a specific combination of oxides made a glass that would shift from amber to purples and blues, depending on the heat and flame atmosphere. Fowler shared this combination with Paul Trautman, who formulated the first small-batch colored borosilicate recipes. He then founded Northstar Glassworks in the mid-1980s, the first factory in the world to devoted solely to producing colored borosilicate glass rods and tubes for use by artists in the flame. Trautman also developed the techniques and technology to make the small-batch colored boro that is used by a number of similar companies. By the time Trautman sold Northstar in 2002, he had composed hundreds of his own recipes for colored borosilicate that are still in production today. In 2004, Trautman came back to making glass, founding Trautman Art Glass. At TAG he developed a number of newer colors that are also industry standards for the boro art community. Fowler continues to teach lampworking and hand-mixing of color in the "Burton style" around the US and Europe. In recent years, with the resurgence of lampworking as a technique to make handmade glass beads, borosilicate has become a popular material in many glass artists' studios. Borosilicate for beadmaking comes in thin, pencil-like rods. Northstar, Trautman Art Glass, Glass Alchemy and Momka's Glass are popular manufacturers, although there are other brands available. The metals used to color borosilicate glass, particularly silver, often create strikingly beautiful and unpredictable results when melted in an oxygen-gas torch flame. Because it is more shock-resistant and stronger than soft glass, borosilicate is particularly suited for pipe making, as well as sculpting figures and creating large beads. The tools used for making glass beads from borosilicate glass are the same as those used for making glass beads from soft glass. Zerodur replaced borosilicate glass in many optical applications. ↑ Pyrex History Archived September 22, 2008, at the Wayback Machine. ↑ "Exploding Pyrex". Retrieved 2009-10-27. ↑ "What is Borosilicate Glass?". qorpak.com. Retrieved 2012-11-02. ↑ "Borosilicato". refmexgl.com. Retrieved 2012-11-02. ↑ Weissler, G. L. (1979). Vacuum Physics and Technology (2 ed.). Academic Press. p. 315. ISBN 978-0-12-475914-5. ↑ "SPACE SHUTTLE ORBITER SYSTEMS THERMAL PROTECTION SYSTEM". Retrieved 2009-07-15. Look up Borosilicate glass in Wiktionary, the free dictionary. Wikimedia Commons has media related to Borosilicate glass. Fuyao Glass Industry Group Co., Ltd.